First rate printing; thin carrier film; fascinating coverage of a good selection of aircraft. 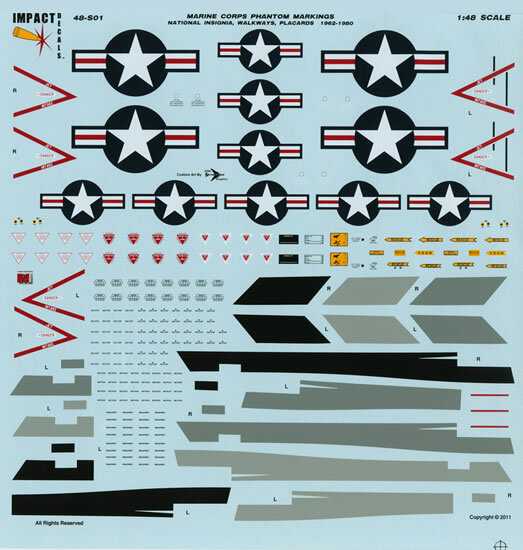 It is not often we see new decals from this Camby, Indiana based decal producer and this is a real pity as what they do release is first-rate indeed. 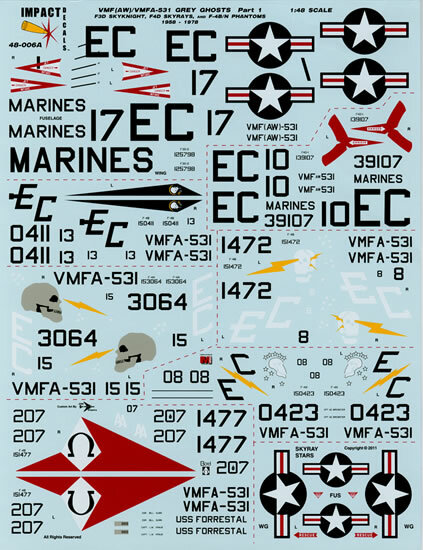 If you were wondering why the sheet features markings for three different aircraft types, it is because the Impact Hobby Decals philosophy is to compile decal sheets that are based on units and/or squadrons rather than by aircraft type. 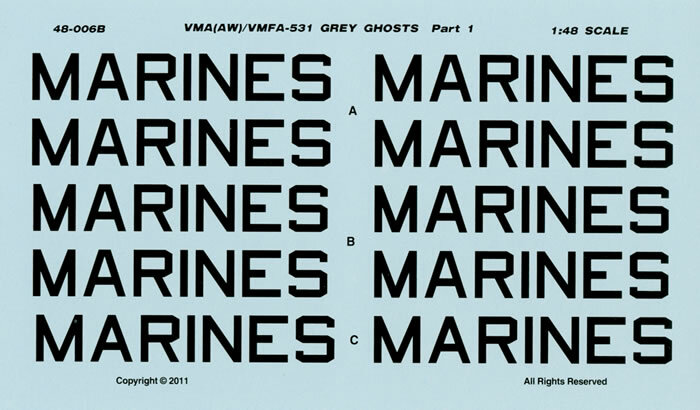 But first a thumbnail sketch on the history of VMFA-531, the Grey Ghosts. The squadron was first activated as Marine Night Fighter Squadron 531 (VMF (N)-531) in November of 1942 and flew the PV-1 (Lockheed Ventura) from Banika in the Russell Island. Following an eleven month tour, the squadron returned to Marine Corps Air Station (MCAS) Cherry Point in the September of 1944 and was deactivated. The rest was only to be short though as the squadron was reactivated in October at Marine Corps Auxiliary Airfield (MCAAF) Kinston) in North Carolina. A short time later the squadron moved to MCAS Eagle Mountain Lake and acted as a training squadron for replacement pilots and ground control intercept operators being sent overseas for the duration of the war. The Squadron moved back to MCAS Cherry Point at the end of World War Two and was assigned to the 2nd Marine Aircraft Wing (2nd MAW) in the March of 1947. 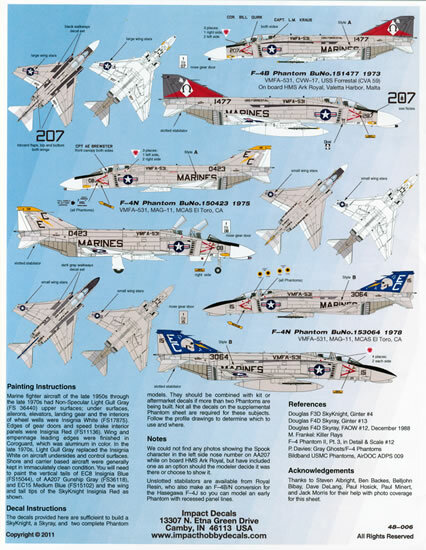 The squadron moved to Danang in South Vietnam in the May of 1965 operating the F-4B Phantom II s flying close air support missions. The squadron received its first F/A-18 Hornet in May 1983 and was decommissioned in March, 1992. A far more comprehensive history can be found by following this link. 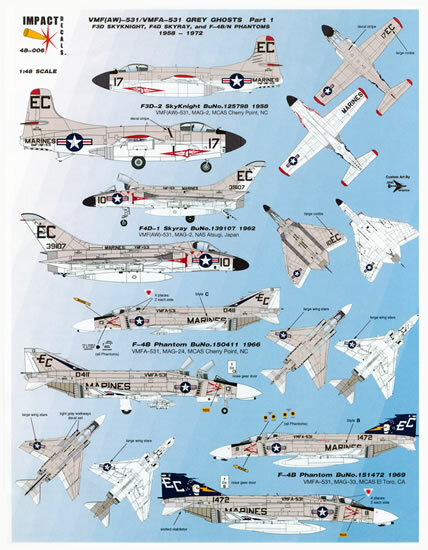 The squadron operated a variety of aircraft types during its life including the Grumman F7F Tigercat, Douglas F3 Skyknight, Douglas F4D Skyray, the McDonnell Douglas F-4 Phantom II B and N, and finally, the McDonnell Douglas F/A-18A Hornet. VMF(AW)-531, MAG-2 - Douglas F-3D-2 Skyknight, Bureau number 125798, modex 17 at MCAS Cherry Point, North Carolina in 1958. The machine has FS16440 light gull grey upper surfaces with FS17875 gloss white undersides. The tips of the wings and horizontal stabilisers are in FS11136 insignia red as is the rear half of the fin cap and the radome and anti-glare panel are in black. VMF(AW)-531, MAG-2 - Douglas F-4D1 Skyray, Bureau number 139107, modex 10 at, Naval Air Station (NAS) Atsugi, Japan in 1962. In FS16440 light gull grey with FS17875 gloss white undersides and control surfaces. The anti-glare panel is in paint scheme for this aircraft is in a medium and the radome is black. VMFA-531, MAG-24 - McDonnell-Douglas F-4B Phantom II, Bureau number. 150411, modex 13 at MCAS Cherry Point, North Carolina in 1966. In FS16440 light gull grey with FS17875 gloss white undersides and control surfaces. The anti-glare panel is black and the radome white. VMFA-531, MAG-33 - F-4B Phantom II Bureau number 151472, modex 8 at MCAS El Toro, California in 1969. In FS16440 light gull grey with FS17875 gloss white undersides and control surfaces. The entire vertical stabiliser and rudder are in FS 15044 insignia blue and the anti-glare panel is black and the radome white. VMFA-531, CVW-17 - F-4B Phantom II Bureau number 151477, modex 207. In FS16440 light gull grey with FS17875 gloss white undersides and control surfaces. The machine exhibits an unusual marking on its vertical stabiliser to say the least. Whilst the squadron was embarked on USS Forrestal (CVA 59) as a part of CVW-17 it took park in training exercises with the Royal Navy. From what I have read in other publications, this aircraft went unserviceable aboard HMS Ark Royal and had its entire vertical stabiliser re-painted to match those of the Royal Navy’s 892 Squadron FG.1 Phantoms so that it could be parked with the other 892 Squadron FG.1s to hide its presence when the carrier docked in Valetta Harbour, Malta. This very well may be the correct reason but I offer another explanation and that is that the vertical stabiliser was painted in 892 Squadron colours as an act of friendly “zapping” as there is ample evidence of this on other airframes from that era. Nevertheless, it makes for an unusual marking on a USMC machine! VMFA-531, MAG-11 - F-4N Phantom II Bureau number 150423, modex 08 at, MCAS El Toro, California in 1975. In FS16440 light gull grey with FS17875 gloss white undersides and control surfaces. The fin cap is painted in yellow (insignia yellow FS33538?) as are the air conditioning inlets on the nose. Anti-glare panel is black and the radome white. VMFA-531, MAG-11 - F-4B Phantom II Bureau number 153064, modex 15 at MCAS El Toro, California in 1978. In overall FS16440 light gull grey with black anti-glare that extends all the way to the tip of the nose radome. The entire vertical stabiliser is in FS15102 medium blue and it wears full colour national insignia. There is no advice as to what company has printed the three decal sheets that make up this package. They are however first-rate indeed. They are thin with an absolute minimum of carrier film around each subject and in perfect register. There is a full and separate sheet of comprehensive stencil data for the F-4 options. This sheet also carries the nation insignia and three sets of walkways. Enough data is supplied for three F-4s. You are pretty much on your own for stencil data for the Skynight and the Skyray options although you do get the red intake lips/danger arrow for the Skyray and the intake warnings for the Skyknight. A separate set of national insignia is provided for Skyknight and the Skyray options. As mentioned previously, you get three sheets with this issue, a large one measuring 8½"x 11" (217mm x 280mm), the F-4 stencil data sheet measuring 8¼" x 8¼" (213mm x 213mm) and a smaller one measuring 3¾"x 63/8" (95mm x 162mm). The two large placement guide/information sheets are printed on good quality glossy paper and provide full colour left and right hand side profiles as well as upper and lower plan views of each option in full colour. 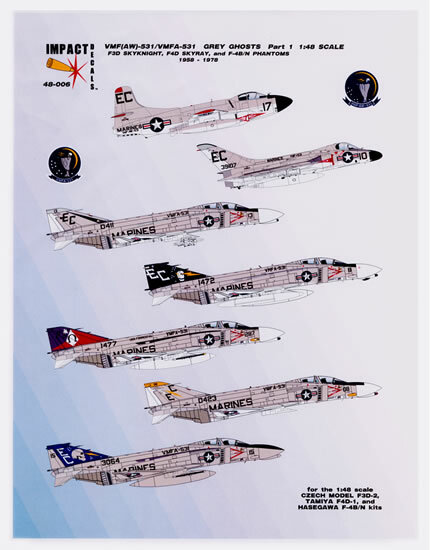 You are also provided notes on the markings of each aircraft type as well as notes to assist you in detail painting. A list of references rounds out the information. The decals and placement guides/information sheets come packed in a clear plastic zip-loc bag. As the title suggest, this sheet is Part 1 of the coverage of the Grey Ghosts so hopefully, Part 2 will feature markings for the F7F Tigercat, the PV-1 Ventura and the F/A-18As operated by the squadron. Given that the release of the new 1/48 scale Lockheed PV-2 Ventura is imminent this will be welcomed! Thanks to Impact Hobby Decals for the review sample.